New England Equine Medical & Surgical Center is uniquely ready to diagnose and treat emergency cases. We have a full staff, laboratory, diagnostic equipment and surgery facility available 24 hours a day, every day of the year. The New England Medical and Surgical Center accepts horses with a referral from your veterinarian or if you do not have a primary care veterinarian, on your consultation with our on-call doctor. During business hours your veterinarian should call our hospital at 603-749-9111 and discuss your horse's issue with one of our veterinarians. After 5:00 pm and on weekends we direct calls to our emergency on-call veterinarian at 603-834-0617. You will receive instructions on how to reach our hospital. Once you are about 30 minutes from our hospital, we ask that you call the emergency number again to alert the staff as to your arrival. For all of our clients, in addition to routine care for their horses, we offer 24/7 emergency services. Services include colic exams, wound evaluation and repair, evaluation of acute onset lameness, and evaluation of injuries from whatever other predicament your horse may get into. When you arrive the appropriate examinations and treatment will be undertaken. Once we determine the likely treatment regime and determined an estimate for treatment, we will ask for a credit card or cash deposit. A check may also be used for a deposit, but must be backed-up with a credit card. On all critical care horses we make an effort to update the owner frequently by phone and/or email. 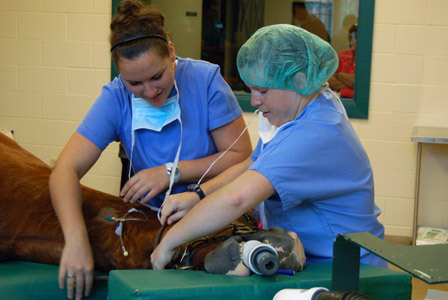 If a horse must have surgery, the surgeon will call with an update when your horse has returned to the stall. Your veterinarian is likewise informed regarding diagnostic findings and response to treatment. Emergencies that involve your horse are never anticipated, but along with your home veterinarian's attention, we are ready to commit our resources to resolving your horse's problems to the best of our ability. Your active participation is welcome. We want you to feel free to remain in the hospital to observe the emergency surgery (colic, fracture, laceration) your horse may need. This allows you as the owner to be the most well-informed and involved with your horse's condition.